On the morning of March 28th, the end of an era was celebrated in Kentucky as the last 2013 Chevrolet Corvette rolled off of the Bowling Green Assembly line – marking the official end of the C6 generation of the fabled Chevrolet Corvette as the plant prepares to launch production of the 2014 Chevrolet Corvette Stingray in less than a month. The last 2013 Chevrolet Corvette built was a 427 60th Anniversary Convertible edition which means that it is powered by a 7.0L (427 cubic inch) – packing 505 horsepower and 470lb-ft of torque. In addition to the high performance engine, this Corvette features the high tech Magnetic Selective Ride Control suspension system that insures that the final C6 built will corner every bit as well as it accelerates. 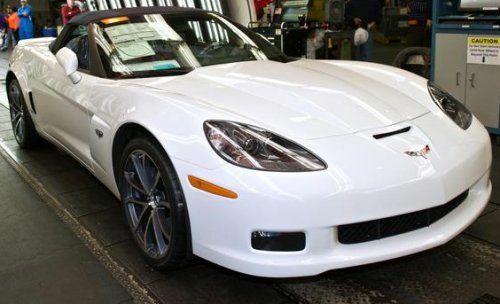 On the outside, the 427 60th Anniversary Corvette Convertible features a bright white paint scheme on a sportier-than-stock body from the Corvette Z06 while a blue cloth top and some great looking split design 5-spoke wheels finish the package. Inside, the 13,466th and final C6 Corvette built features the blue leather interior of the 427 60th Anniversary Convertible package. By the way, the engine of this final C6 was hand built be Corvette chief engineer Tadge Juechter at the Performance Build Center. All of the 427 GM engines are hand built but the engine in the final 2013 Corvette was built by the man who helped to bring the 2014 Corvette Stingray to life. Unfortunately for those who are sitting there, reading this article and wondering about purchasing the last 2013 Chevrolet Corvette 427 60th Anniversary Convertible Edition – this Corvette will not be offered to the public. Instead, once the company has gotten their fill of images of the final C6 Corvette, it will be packaged up and shipped off to the GM Heritage Center in Sterling Heights Michigan. Even though production of the 2013 Chevrolet Corvette has come to an end, those who want to get their hands on a C6 shouldn’t lose too much sleep. As of February 1st, there were roughly 6,100 2013 Corvette coupes and convertibles in dealership inventories across the country which translates to 5-6 months worth of vehicles are the current sales rate. Even though 2013 was the final model year for the C6 – which usually translates to slower sales as buyers wait for the new model – the addition of the 427 Convertible and the 60th anniversary edition helped to improve numbers for the 2013 model year. GM built 13,466 Corvettes for 2013 while only 11,747 were produced for the 2012 model year. However, both of those figures will surely pale in comparison to the sales figures for the 2014 Chevrolet Corvette Stingray when it arrives later this year. Now that production of the 2013 Chevrolet Corvette has come to an end, the plant workers in Bowling Green can begin preparing the facility for the upcoming production of the 2014 Chevrolet Corvette Stingray. As this final Corvette passed from station to station on the assembly line, workers began tearing down each area almost as soon as the car was onto the next stop on the line. This tear down process began with the frame shop but as the very last C6 Corvette pulled away from the inspection area of the line – the entire production area of the Corvette was being dismantled as needed. This revamping of the Bowling Green plant is part of a $131 million investment in the facility to build the new Corvette Stingray and that figure includes a new body shop that will help produce the all aluminum frame of the C7 Stingray. During the nine year run of the C6 Corvette, the Bowling Green plant produced 215,100 examples of the storied American high performance sports car.